Looking to add another little critter to your clean-up-crew (CUC)? Maybe you could pick out a few cerith snails, the next time you head to your local fish store. Ceriths are small, snaily scavengers with a pointy spiral shell. They only grow to be about 1 inch long and are well suited for small or large tanks alike. 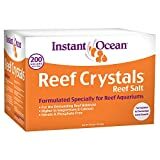 A popular member of many reef aquarium clean-up crews, this inexpensive reef invertebrate shares space with reef tanks all over the world. These snails are also known to be hardy and generally ship easily. These snails naturally occur in most oceans worldwide, especially in the tropical Indo-Pacific (Kenya, Red Sea, Mozambique, Madagascar, Western India and Tanzania). Still, most of the specimens traded for aquariums come from the Caribbean. Out in mother nature, they tend to prefer shallow waters near the low-tide line and would constantly crawl through the sediment deposits in search of food. Their favorite substrates are seagrass meadows, mudflats, and mangrove forest edges. Ideally, their tank would have a sand substrate and a lot of live rock to provide food and hiding places. 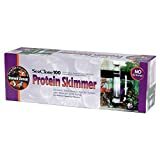 Even though they are generally considered to be pretty hardy, it would be best to avoid major, dramatic swings in water parameters or an unhealthily high concentration of nitrate. Thanks to their small size, Cerith snails are suitable for nano tanks or larger. If you do have a nano, small or new tank, you might want to be sure to watch and make sure they have enough food to eat and add some additional food to the aquarium if you think there is a risk of starving. These snails are scavengers. They will crawl through your tank looking to make a nice meal of any detritus, food waste, fish waste and algae. When you compare that with nassarius snails—that makes them much more valuable members of the cleanup crew. In a large, established tank, with a sufficiently low density of clean-up crew members, you may not need to do anything special to feed your cerith snails. However, you do want to avoid over-crowding, as this can lead to starvation. In fact, many aquarium owners have too many invertebrates in their clean-up-crews (CUCs). To make sure your inverts have enough food to forage, keep less than one for every 10-gallons of aquarium water volume—and reduce even further than that depending on what other invertebrates you have in your tank. 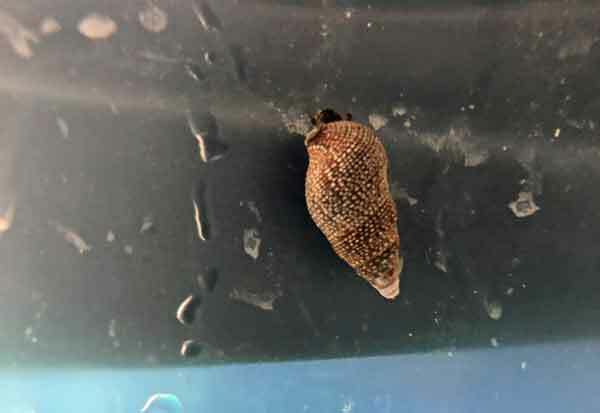 In addition to providing an interesting visual addition to your aquarium, Cerith snails are also functional, because they will move around your tank and scavenge any uneaten food. When they’re not eating, they may bury themselves in the sand. That’s fun to watch and also functional. Stirring up the sand bed tends to be useful, so you don’t develop dead spots. They are active nibblers and are in constant motion for food, but you might find that they are most active after lights out—so be sure to check back on them after lights-out to enjoy your new purchase. If you are lucky, you may even get to see the lay eggs on the aquarium glass—so cool. Cerith Snails are peaceful cleaners that won’t disturb or attack any other tank mate. Their small size makes them advantageous when compared with some other larger members of the clean-up-crew because they are able to crawl into tight spaces, as well as in and around frags without knocking them over. These snails will technically get along fine with your other aquarium inhabitants, but that doesn’t mean that every other fish/invert will get along with them. Lots of fish and invertebrates enjoy a nice escargot meal. So don’t keep ceriths with anything that would snack on them—that means avoid triggerfish, hawkfishes, etc. You will also want to be careful if you have hermit crabs. As you know, hermit crabs don’t make a hard, protective shell on their own. Instead, they rely on the discarded shells from mollusks. Occasionally, boisterous hermit crabs evict snails from their shells. If you plan to keep hermit crabs and cerith snails together, make sure your crabs are well-fed and have multiple, suitable shells available to switch into. You want to make it very, very easy for the hermits to chose an unoccupied shell. Peaceful, reef-safe and won’t harm any tank mate. They burrow in the sand substrate, stirring it and help aerate it. 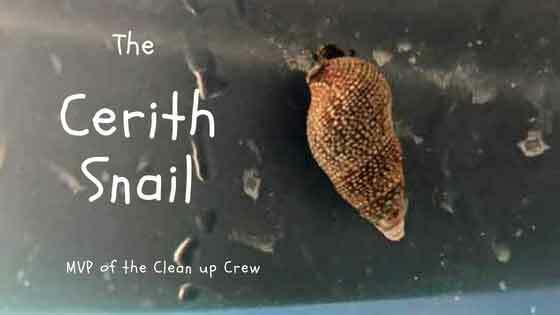 The only con I can think of is this—I’m always a bit disappointed at how thoroughly clean up crew members like the cerith snail do. Buyer beware, they won’t replace the work and maintenance you have to do—they just add a level of interest and natural cleanup, but they won’t keep things immaculately clean. What do you expect? They are snails. What do you think about the lowly cerith snail?